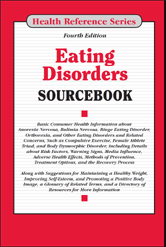 Provides basic consumer health information about risk factors, causes, and complications of eating disorders, along with facts about prevention, treatment, and recovery. Part I: What Are Eating Disorders? Section 1.1—What Is an Eating Disorder? Section 2.1—What Are Normal Eating, Disordered Eating, and Eating Disorders? Section 17.1—What Are Co-Occurring Disorders? Section 18.1—What Causes Eating Disorders? Section 40.1—How to Assess Your Weight? Section 43.1-What is Healthy Weight Loss? Section 43.3-Are Detox Diets Safe?